Golf Maui at the Royal Kaanapali and Kaanapali Kai! 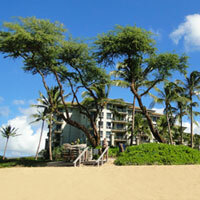 If you're looking to golf Maui, the Kanaapali Beach Resort offers numerous courses to choose from. With their prime location, these recently renovated courses are a popular choice. Reserve a tee time at the Kaanapali Beach Resort Royal or Kaanapali Kai Course! Read reviews for these courses. The challenging Royal Kaanapali (Tournament North Course) is 6700 yards long, and a par 71 course. It was rated 4.5 out of 5 stars by Golf Digest in 2008, and is the perfect choice for an avid golfer! The Royal Kaanapali Course starts you off at sea level with a 550 yard, par 5 hole. The course's beachfront holes will lead you along the beautiful Maui shoreline, and then up to the foothills of the West Maui Mountains. The Kaanapali Kai Course (Resort South Course) is a par 70 course with a 6400 yard layout. It winds through resort homes, an old sugar cane plantation, and the vintage Sugar Cane Train's railroad. It is said to be beautiful with its array of native flowers such as hibiscus, bougainvillea and plumeria. And of course, this being Maui, there are graceful coconut palms bordering many of the fairways. You'll even see a few Norfolk Pines. As an inexperienced golfer, the Kaanapali Kai Course is the one I would choose for myself when I eventually golf in Maui - this course has been designed for players of all levels, from beginner to frequent golfer. 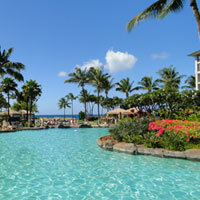 Read reviews for the Kaanapali Kai. Although these courses were originally built in 1962, they recently underwent a massive $13 million renovation which was overseen by famed golf course architect Robin Nelson. Reviews of the Kaanapali Beach Resort courses prior to the renovations tended to be mixed - but since the renovations have been completed, I wasn't able to find a single bad review. 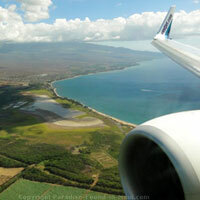 And of course, the courses' picturesque views of the ocean and neighbouring islands of Molokai and Lanai can't hurt! If you're not exactly the most experienced golfer, the fact that these courses are 18 holes long might be a bit daunting. Fortunately, they've come up with a perfect solution: the "Golf My Way" package. This package allows you to golf 18 holes over a week's time. This option is also great for anyone who just doesn't have the time to fit in all 18 holes at once. Having the option to space them out over several days is the perfect solution! If you'd like to book your round of golf at the Royal Kaanapali or Kaanapali Kai course, or even if you just want more information on things like pricing, I recommend that you check out GolfNow.com! They are the number 1 retailer of tee times in the U.S.A. and Canada, and have very competitive pricing. They are owned and operated by the Golf Channel. 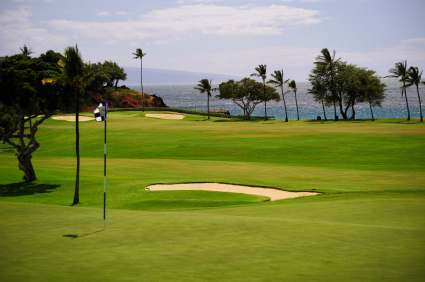 Read reviews for golf courses at the Kaanapali Beach Resort. Have YOU ever golfed one of these Kaanapali courses? If so, we'd love to hear all about it. Click here to share your story, and make it a permanent part of this site! 1) Kapalua, Maui offers world class golf in Maui. Find out more in Kapalua: Golf at World-Class Courses Just Like the Pros! 2) Find out more about what the Kaanapali Beach Resort area has to offer here: Kaanapali, Maui: A Playground Fit for Royals!